Samuel Coleridge-Taylor (15 August 1875 – 1 September 1912) was an English composer of Creole descent who achieved such success that he was once called the “African Mahler”. 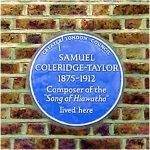 Samuel Coleridge-Taylor was born in 1875 in Holborn, London, and brought up in Croydon by his mother (whose brother was a professional musician) and her father. Taylor studied the violin at the Royal College of Music and composition under Charles Villiers Stanford. 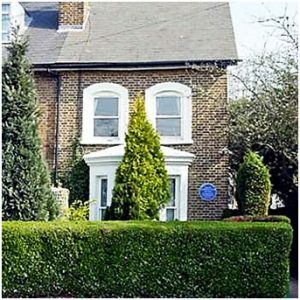 He also taught, soon being appointed a professor at the Crystal Palace School of Music; and conducted the orchestra at the Croydon Conservatoire. The young man later used the name Samuel Coleridge-Taylor, with a hyphen, said to be following a printer’s typographical error. In 1899 Coleridge-Taylor married Jessie Walmisley, whom he had met as a fellow student at the RCM. Jessie had left the college in 1893. Her parents objected to the marriage because Coleridge-Taylor was of mixed-race parentage. The couple had a son, named Hiawatha (1900–1980) after a Native American immortalised in poetry, and a daughter, Gwendolyn (1903–1998). Later their daughter took the name Avril and became a conductor-composer in her own right. By 1896, Coleridge-Taylor was already earning a reputation as a composer. He was later helped by Edward Elgar, who recommended him to the Three Choirs Festival. His Ballade in A minor was premiered there. His early work was also guided by the influential music editor and critic August Jaeger of music publisher Novello; he told Elgar that Taylor was “a genius”. On the strength of Hiawatha’s Wedding Feast, which was conducted by Stanford at its 1898 premiere and proved to be highly popular, Coleridge-Taylor made three tours of the United States. He became increasingly interested in his paternal racial heritage (he was the youngest delegate at the 1900 First Pan-African Conference held in London), as his father was descended from African-American slaves freed by the British after the American Revolutionary War; the Black Loyalists were resettled in Nova Scotia, and then 1200 moved to Sierra Leone in 1792, establishing the colony of Freetown. At one stage Coleridge-Taylor seriously considered emigrating to the US. In 1904, he was received by President Theodore Roosevelt at the White House, a rare event in those days for a man of African descent. Coleridge-Taylor sought to do for traditional African music what Johannes Brahms did for Hungarian music and Antonín Dvořák for Bohemian music. Having met the African-American poet Paul Laurence Dunbar in London, Taylor set some of his poems to music. A joint recital between Taylor and Dunbar was arranged in London, under the patronage of US Ambassador John Milton Hay. It was organised by Henry Francis Downing, an African-American playwright and London resident. Dunbar and other black people encouraged Coleridge-Taylor to draw from his Sierra Leonean ancestry and the music of the African continent. Due to his success, Coleridge-Taylor was invited to be one of the judges at music festivals. He was said to be personally shy but was effective as a conductor as well. Composers were not handsomely paid for their music, and they often sold the rights to works outright to make immediate income. This caused them to lose the royalties earned by the publishers who had invested in the music distribution through publication. The popular Hiawatha’s Wedding Feast sold hundreds of thousands of copies, but Coleridge-Taylor had already sold the music outright for the sum of 15 guineas, so did not benefit directly. He learned to retain his rights and earned royalties for other compositions after achieving wide renown. Coleridge-Taylor was 37 when he died of pneumonia, a few days after collapsing at West Croydon railway station. He was buried in Bandon Hill Cemetery, Wallington, Surrey (today in the London Borough of Sutton).